Everbound is the sequel to Everneath. In Everbound, Nikki is trying to adjust to life without Jack. She is bullied and blamed by those around her and her father thinks she is going (or already is) crazy. Nikki is trying desperately to get Jack back and that journey to get to Jack takes up a majority of the book. I felt badly for Nikki throughout most of the book. She really loves Jack deeply and is trying desperately to get Jack back once and for all. I think this book really shined in that journey. Brodi Ashton writes fantasy well (and I hope she writes fantasy in her next series). I found myself much more engrossed in this book than I did in Everneath. Everbound is full of action and paranormal elements. Fans of the first book in this series won't be disappointed. 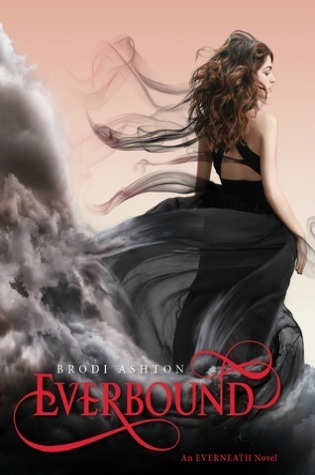 Everbound ended with a pretty devious twist and made me eager to see what happens in the final book in this trilogy. PPS- Jack, what are you hiding? I love paranormals with a good twist. I'll have to look it up. Thanks. I wholeheartedly second your PS-I hated Cole at the end of this book (and actually through most of this book as well).